Here is the fifth installment in my study into Floriography — the cryptological communication through flower use or arrangement. Lilac ~ First love, humility, youthful innocence, modest and pure emotions. In Victorian times, giving a lilac meant that the giver is trying to remind the receiver of a first love. Lilacs can also express confidence that the giver has for the receiver. A sprig of lilacs, especially white lilacs, symbolizes innocence. Greek mythology tells of a beautiful nymph named Syringa. Her beauty captivated Pan, the god of the forests and fields. He chased Syringa through the forest. This frightened Syringa, so she escaped him by turning herself into an aromatic bush – the flower we now refer to as lilac. Larkspur ~ All larkspur flowers symbolize joy and love, with the meaning changing slightly according to color: Pink for fickleness, White for happiness, and Purple for first love. Larkspur is easily confused with Delphinium due to their similar appearance. While both are members of the buttercup family, larkspur are annuals with more delicate flowers in shades of white, pink and lavender, whereas Delphinium are perennials in shades of purple, blue, red, yellow and white. Greek legend relates that Achilles’ mother requested her son’s armor be given to the bravest warrior during the Battle of Troy. To the dismay of the brave warrior Ajax, the armor was awarded to Ulysses. This so upset Ajax that he threw himself on his sword and small blue larkspur flowers grew up everywhere drops of his blood hit the ground. Lisianthus ~ Appreciation, gratitude and charisma. 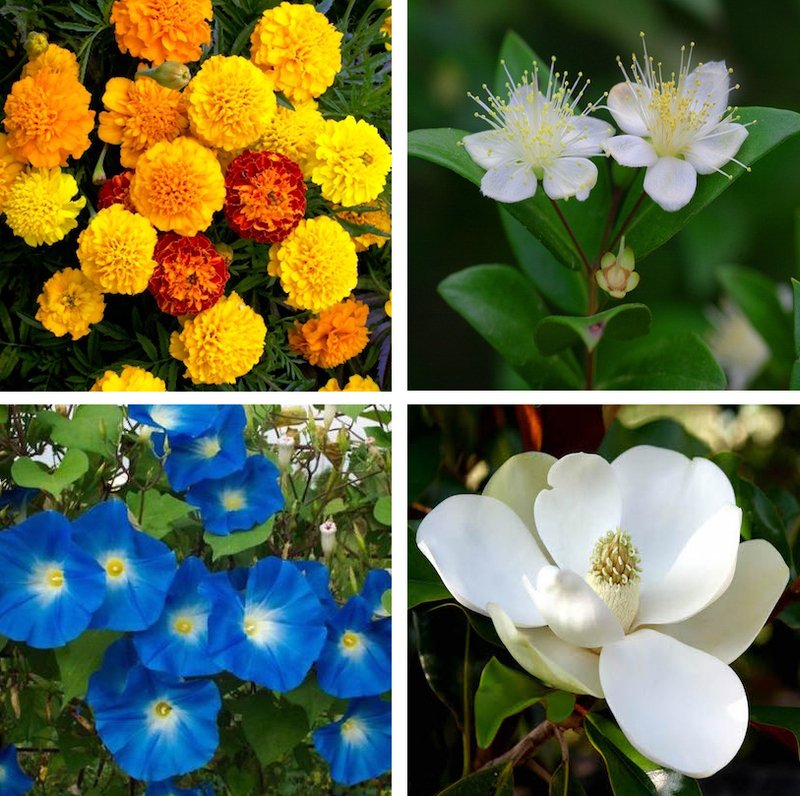 This flower comes in practically any color, symbolism varying. Light pink for a new mother or young girl, deep blue evokes a sense of peace and openness, and bright red carries a meaning of love and passion between two people. 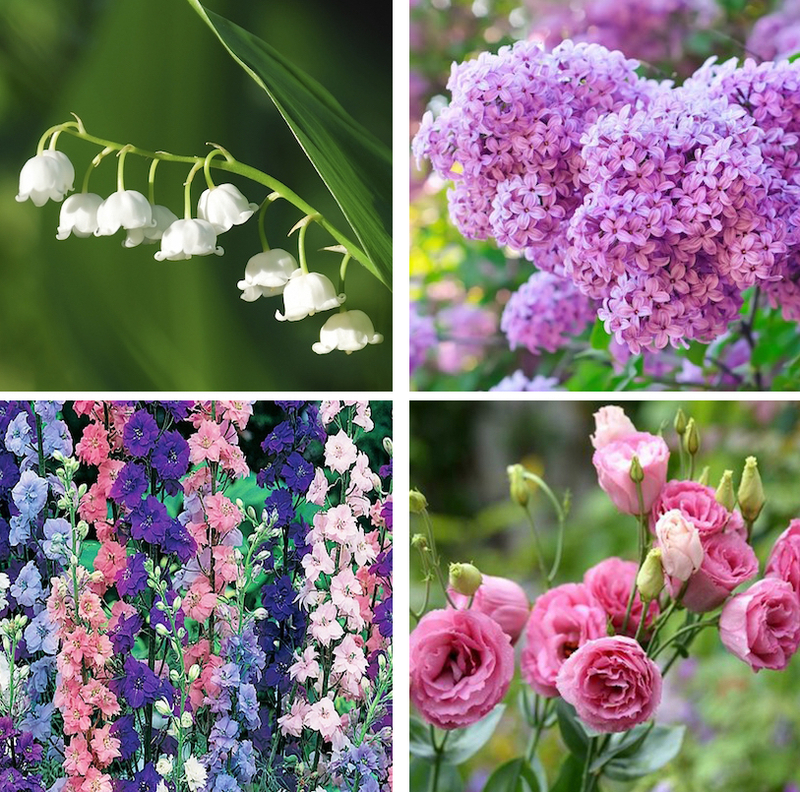 Top: Lily of the Valley and Lilac. Bottom: Larkspur and Lisianthus. Marigold ~ Comforts the heart; sacred affection, caress, sorrow, despair and grief. All types of Marigold offer the same basic meanings because they all share the same bright yellow, red, or orange color. Victorian flower language experts considered it a symbol of despair and grief, and also linked it with cruel treatment towards a loved one. Marigolds were carried as love charms or spells in the Middle Ages by both genders who wanted to attract someone new. Myrtle ~ Love in absence, remembrance. According to ancient Greek mythology, Venus, the goddess of love visited the Isle of Cytheraea but was ashamed to show herself because she was naked, so she hid behind the myrtle tree. She later adopted the tree as her favorite. The Greeks considered it sacred to Venus and it was thought to inspire lasting love. In 1858, Queen Victoria’s daughter (also named Victoria) carried the first sprig of myrtle from her mother’s garden as she walked down the aisle to be wed. Since that time, each royal bride has carried a cutting from the bush to bring good luck and prosperity in the royal marriage. Morning Glory ~ The Victorian meaning of Morning Glory is either unrequited love or mortality of love or love that is in vain. References can be found in Victorian literature and etchings on Victorian gravestones to signify a love that never ended. Magnolia ~ Sweetness, beauty, love of nature, nobility and dignity, splendid beauty. In Victorian times Magnolias primarily symbolized dignity and nobility. A French botanist by the name of Pierre Magnol (1638 – 1715) helped scientists determine that plants came in families and not just species. Guess who magnolias are named after? Top: Marigold and Myrtle. Bottom: Morning Glory and Magnolia.